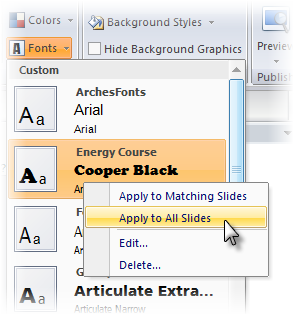 In Articulate Storyline, one of the easy ways you can quickly customize your project is by changing the theme fonts. This allows you to alter the font used for headings, body text, and the text used for quiz questions and answer choices. You can apply the theme fonts Storyline gives you, or you can set up your own theme fonts. Articulate Quizmaker users: Theme fonts are shared between Storyline and Quizmaker, so any customizations you make to the theme fonts in Storyline will affect Quizmaker as well, and vice versa. The heading font is used for slide titles, the question text on quiz questions, and the title on marker labels. The body font is used for body text on your course slides, including text that you type into text boxes, captions, buttons, and shapes. It's also used for the answer choices on quiz questions and the descriptive text on marker labels. To see the theme fonts available, click the Design tab on the Storyline ribbon, and then click the Fonts dropdown. If you've set up any theme fonts, they'll appear at the top of the list, in a section called Custom. The Built-In theme fonts will appear below that. The theme fonts used on the currently selected slide are shown in orange. For each set of fonts listed, you'll see the name, the heading font, and the body font. To apply a set of theme fonts to all slides, choose the Fonts dropdown from the Design tab, and left-click the theme fonts you want to use. Apply to Matching Slides: This applies the theme fonts to all slides that use the same slide master as the current slide. Click the Design tab on the Storyline ribbon. Select Create New Theme Fonts at the bottom of the list. The theme font editor appears. When you make changes to either of the two fields on the left side of this window, the Sample window on the right side of the window will change to show your choices. For the Heading font, choose the font you'd like to use for headings. This is also the font used for question text when you are building quiz question slides. For the Body font, choose the font you'd like to use for body text. This is also the font used for answer choices when you are building quiz question slides. In the Name field, enter a name for your new theme fonts. Now the custom theme fonts will be available in any Storyline course you build. Right-click the theme fonts you want to modify. 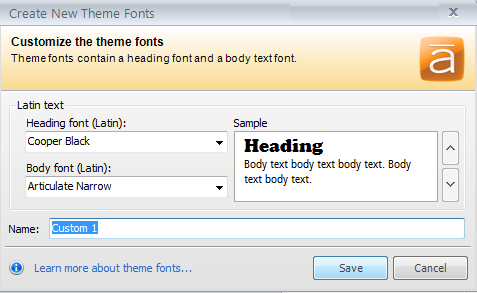 The theme font editor appears, and you can modify either font as you like, using the same guidelines shown above for creating new theme fonts. First apply the built-in theme fonts that you want to base yours on. 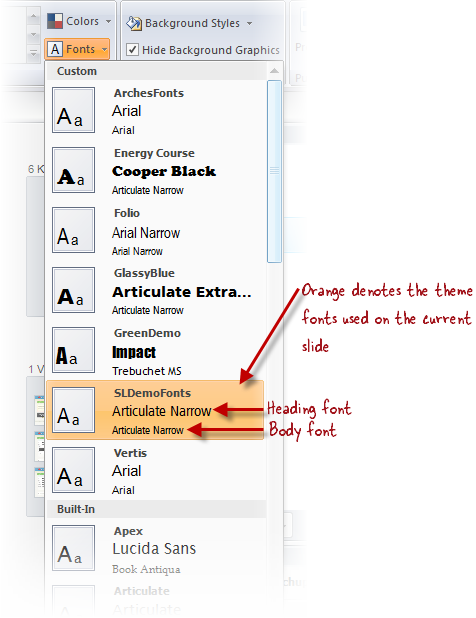 On the Design tab, click the Fonts dropdown and choose Create New Theme Fonts. This will open up the theme font editor, and the fonts will default to the ones from the theme fonts you just applied. Now just make any changes you like and save the new theme fonts under a different name. How Do Theme Fonts Relate to My Font Choices on Slide Masters? In the same way that you can apply theme fonts to specific slides in your course, you can also apply theme fonts to a slide master layout. When you do, any slide on which you've used the affected slide layout will inherit those same theme fonts. Anytime you apply theme fonts, though, you can always override the font assignment on the slide itself by manually customizing any individual text box.